Gratitude. Tradition. Lots of food, family, and friends - if you're fortunate. To some, Thanksgiving means catching up with old friends, feasting on traditional and non-traditional meals, catching up on sleep or watching re-runs of Curb Your Enthusiasm (me). But to others, it may not be different than any other day, especially if they have to work. Reminder to thank those who might be working events, or at a movie theater, behind a kitchen, in a cop car, in the hospital, working late to make sure we have power or cable, or driving a cab or an ambulance. Those who are working so we can have our conveniences. Lots are working because they don't have a choice. Just a simple "thank you" is good enough to let them know we appreciate it. There's still time to order your Thanksgiving turkey or entire meal from Whole Foods. You can get your turkey fresh, cooked, or ready to cook. You can also get the entire meal to serve 16 for $189.99. They also have smaller meals depending on how many are dining. On Thanksgiving Day, Mrs. K's Tollhouse Restaurant will be serving a 4 course meal for $55/person. They'll have turkey and ham as well as prime rib and other options. A reservation is strongly suggested. For details please contact the restaurant at 301.589.3500. Twisted Willow Restaurant & Bar inside the Doubletree Hotel on Colesville will be doing a Thanksgiving Day buffet from 12noon - 6pm for $29. Kids under 4 eat free. You can check out their buffet menu on their Facebook page. The Society Lounge confirmed they will be open on Thanksgiving evening, after 5pm. They will have some specials, but those are TBD. Check back for updates. After dinner, you can hit up AFI Silver Theatre on Thanksgiving night and see Wizard of Oz at 7pm. On Black Friday and Thanksgiving weekend, The Godfather will feature one showing per day: Fri, Nov 23, 4:00 Sat, Nov 24, 4:00 Sun, Nov 25, 8:00. Fenton Street Market will be launching their first ever holiday street market on Small Business Saturday, November 24, running through the Saturday, December 22 (for last minute shoppers). Hours are 10am - 4pm and they will feature over 75 vendors. The Fillmore is hosting the first annual "Giving Thanks" event on Thanksgiving Day. They will provide a free lunch at the venue for those in need from 11am - 2pm. They are currently looking for volunteers and donations (food and clothing). To volunteer, please call The Fillmore at 301.960.9999. The Wheaton Patch mentioned that the non-profit "A Wider Circle" still needs sponsorship for families who are less fortunate in Silver Spring, Aspen Hill and Wheaton. The center is located at 9159-C Brookville Road, Silver Spring. As per the article, the items they are requesting are low-sodium canned beans, yams, vegetables, collard greens, low-sodium gravy, stuffing mix, and cranberry sauce. The Thanksgiving Parade on November 17 is still looking for volunteers. If you're interested, call 240-777-6821. The Thanksgiving Parade will start at 10am on Ellsworth and Veteran's Place. The parade will head South on Georgia and will end at Silver Spring Avenue. Don't forget about the road closures through 1pm on that route. Also, the Spring Street and Ellsworth garages are closed during the parade so plan other options for parking. 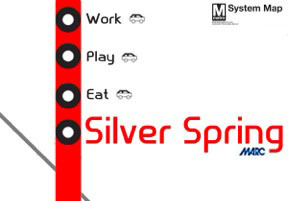 The Silver Spring metro stop is just a few blocks away and that will be your best bet to avoid the cluster. Heard Jackie's is not open. Is Kitchen Bar open?